It is definitely soup weather and this recipe for Roasted Butternut Squash Soup is a great way to warm up! Be sure to pick up some “Mexican Kitchen Cartel” from any of The Spice Co’s retail partners to make this soup. Squash are defined as fruits that are members of the gourd family, which are further classified as either summer or winter squash. They originated in the Americas over 10,000 years ago and were cultivated for their seeds as they typically contained little flesh. The squash were more commonly hollowed out and used as cooking utensils, musical instruments and beverage flasks. Summer squash which include the zucchini, pattypan and crookneck varieties have a very soft flesh and delicate skin as they are harvested before they have fully ripened, which is why their seeds are also soft and not matured allowing us to readily eat them raw or cooked. Prior to cooking most cooks will remove the undeveloped seeds as they can be quite mushy when cooked with a mucilage like texture. Summer squash varieties do not store well and are usually consumed within a week of being harvested. 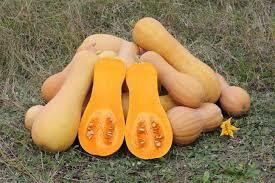 Winter squash are harvested only once they have matured. Their skin has toughened up and aged into a hardened rind which protects the fully developed seeds for future use .Fully ripened varieties of winter squash can be stored for three to five months if kept between 8 °C and 12 C ° in a dark, dry and well-ventilated area. Do not refrigerate your winter squashes unless they are cooked or have been cut as this will greatly compromise their shelf life. Butternut squash is shaped like a vase with smooth beige skin and orange flesh. They are classified as a winter squash which means that they differ from summer squash in that it is harvested and eaten as a mature fruit; when the seeds have matured and the skin hardens into a protective rind. Butternut’s tend to contain more water than other squash and tastes similar to sweet potatoes. Winter squash are high in fiber an excellent source of potassium and vitamins B and C. The deeper orange the color of the flesh, the more carotene it contains. In South Africa these ground nuts as they are called, are often roasted in a fire pit or barbequed. The squash can be cooked whole or peeled and wrapped with foil and seasoned with nutmeg and cinnamon. When cooking squash in this manner; insert a fork into the flesh as you would with potatoes to test for doneness. Squash flesh can also be frozen. To freeze in sections, simply blanch the pieces for one minute, cool immediately and place in freezer bags. Once cooked, the flesh can be diced and added to soups, stews, risotto and curries. We picked up some butternut squash over the holiday weekend from the farm gate and cooked them up in a soup. I especially enjoy this soup served with a rosemary foccacia. Pre-heat oven to 350f. Cut the butternut squash in half. Remove the seeds from squash and place squash, carrots and apple on a parchment lined baking sheet. Bake for about 30-40 minutes or until tender. Remove from oven and allow it to cool for five minutes. Over medium heat lightly sauté the onion and garlic in butter in a large sauce pan until translucent. Scoop the butternut squash pulp from its skin and add it to the onion mixture. Now add the “Mexican Kitchen Cartel”, vegetable stock to the pot as well. Cook over medium high heat for 15 -20 minutes. If you have any cooked or candied bacon around… garnish the soup with it! 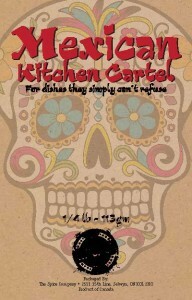 Mexican Kitchen Cartel is a smoky blend of traditional seasonings and spices! Posted on Friday, October 28th, 2016 at 7:59 pm	and is filed under Recipes.